Sound (8.1/10) – The Rock Jaw Alfa Genus utilizes a tuning system in the form of threaded nozzles, which can be swapped to alter the sound. Variable tuning earphones are not a novel concept but in my experience interchangeable nozzles are more effective in changing the sound of an earphone than rear ports or tuning screws. The last earphone I encountered with this kind of setup was the Torque t103z. The three settings of the t103z were extremely varied, but none impressed me very much, which is not the case with the Alfa Genus. Three pairs of color-coded nozzles are included with the Alfa Genus – the silver and black were original “enhanced bass” and “reference” configurations, respectively, while the gold (aka champagne) nozzles were added later, meant to fit between the other two in sound tuning. There are sizable differences in sound between the nozzles. The silver pair delivers a v-shaped, enhanced-bass sound along the lines of a Brainwavz S1. The bass is powerful and very deep, but also a bit intrusive and boomy. For an earphone with plentiful bass it’s quite good, but also leaves some room for improvement on the fidelity front. The black nozzles follow the original “reference” tuning, which is much flatter-sounding. 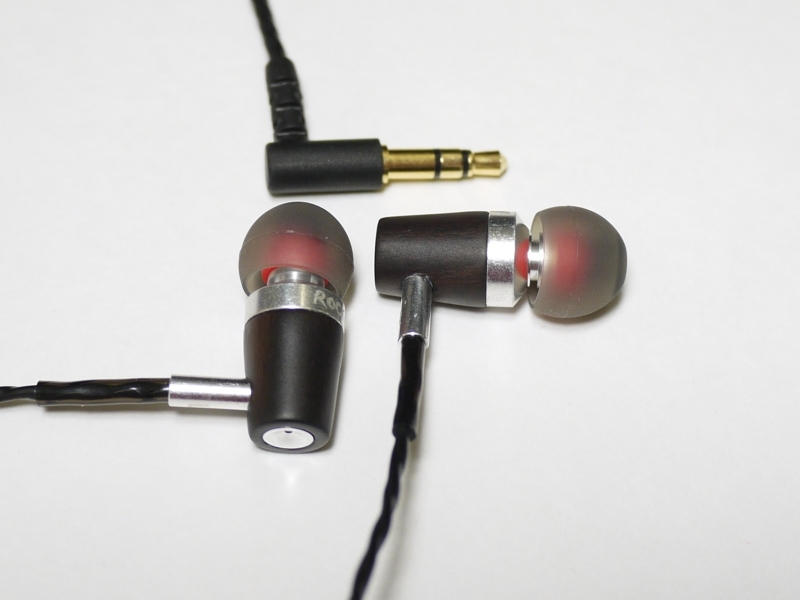 It lacks the powerful bass of the silver nozzles and has better clarity with no bass bloat at all. Unfortunately, severing the bottom end of a v-shaped signature means that what remains is bright treble. Indeed, with the black nozzles the Alfa Genus sounds somewhat bright and a little harsh, partly because there is no longer that heavy bottom end to counterbalance the prominent treble. The third and final option are the gold (champagne) nozzles, which were not present in older batches of the Alfa Genus. The tuning of these is positioned between the other two, but closer to the black “reference” setting. The gold configuration provides a warmer, smoother, slightly bassier sound and could be nicknamed the “natural” setting – while the black tuning sounds a little clearer, it is also brighter and harsher. Compared to the enhanced-bass silver nozzles, the gold ones sound clearer, tighter, more balanced and neutral, and again more natural. Interestingly, the gold nozzles raise acoustic impedance noticeably compared to the other two, resulting in a slightly quieter sound. As always, the sound score provided is given with preferred tuning (gold nozzles). The silver enhanced-bass nozzles are also very good and would score maybe 0.2 less. The black nozzles are the one setting I am not a fan of with gold as an alternative. Because of the wide variation in audio performance between the nozzles, I thought it best to split them up when putting the audio performance in context. The silver configuration of the Alfa Genus boasts more bass than the average in-ear, sounding deeper and more impactful at the expense of being a little boomy. In this configuration the Alfa Genus is bassier – and more v-shaped on the whole – than sets like the Ostry KC06, Philips TX2, and T-Peos Rich200, but also not as clear. The gold nozzles, on the other hand, have very well-measured bass response. They are not as bassy as the TX2, Rich200, Ostry KC06, or even the Havi B3 Pro I. The bass is also quite tight – more so, for example, than that of the mid-bassy KC06. Compared to more analytical earphones such as the BA-based MEElectronics A161P and the VSonic VC02, which have rather flat bass with good extension, the Alfa Genus has a little more mid-bass and sounds less neutral. Through the midrange and treble, the gold tuning of the Alfa Genus is balanced and smooth – more so, for instance, than the TX2 and Rich200. It is brighter than the Havi B3, but also a touch clearer thanks to having slightly greater upper midrange presence and less warmth. In fact, clarity lags just a hair behind the pricier, BA-based MEElectronics A161P. The black nozzles make the Alfa Genus brighter and introduce a bit of harshness, for me sounding a little too sharp in the treble and colored in terms of overall tonality. The presentation of the Alfa Genus doesn’t change much between the silver and gold nozzles – both put the Rock Jaw unit ahead of the somewhat congested-sounding Rich200 and behind the TX2 and KC06 in soundstage size. With the black nozzles you get a more forward sound that gives up some soundstage width and imaging ability. Its enhanced-bass tuning fashions the Alfa Genus into a strange beast, one that maintains a rather lean note presentation through the midrange and treble while delivering gobs of deep, powerful bass. Compared to VSonic’s VSD1S, the Alfa Genus has slightly more potent bass punch but sounds less warm and full-bodied overall. Treble is a little more present with the Rock Jaw set, but still less sibilance-prone than that of the VSonic. The Alfa Genus also sounds a little clearer thanks to the thinner note presentation and extra treble sparkle whereas the VSD1S has a more spacious and out-of-the-head soundstage. Brainwavz’ venerable S1 is the best all-around signature match I could find for the silver nozzles of the Alfa Genus. Both are v-shaped IEMs with heavy bass and prominent treble. The Alfa Genus is a touch boomier at the low end and less full-bodied in the midrange. As a result, its mids sound a touch more recessed, but also clearer. It is also smoother at the top and has marginally better imaging. The dual-driver MOE-SS01 makes for an interesting comparison as its mildly v-shaped signature falls right between the silver and gold tunings of the the Alfa Genus. Next to the silver configuration, the SS01 is lighter on bass (mid-bass, mostly – there’s still plenty of deep bass), a little clearer, and more aggressive through the upper midrange and treble. The Rock Jaw has a deeper v-shape to its sound signature, sounding bassier but more bloated in comparison. Its midrange is more recessed and overall it is slightly warmer and smoother. In this configuration I preferred the more balanced SS01. Switching the Alfa Genus to the gold tuning nozzles instantly turns the tables on the SS01. With the gold nozzles in place the Rock Jaw sounds more balanced and natural. It has stronger mids, less prominent bass, and smoother treble than the SS01, making the MOE seem overly bassy and a little too edgy up top in comparison. With the gold nozzles in place, I found the sound of the Alfa Genus preferable to that of the SS01. As with the MOE-SS01, the HiSound BA100 made for an especially interesting comparison as its sound fits between the gold and black nozzles of the Rock Jaw Alfa Genus, though in this case I preferred both configurations of the Rock Jaw unit. With the gold nozzles in place the Alfa Genus sounds a little warmer and more natural than the BA100. Its bass is more full-bodied and realistic. The BA100 is a little closer to neutral tonally, but also harsher and more forward, intimate, even congested in terms of presentation. Switching the Alfa Genus to black nozzles levels the field a little – in this configuration the Alfa Genus is brighter than the BA100, but also a little clearer. In my experience the brightness is a little excessive and makes certain things sound sharper than I like. The BA100 is again a little more neutral, this time not as bright as the Rock Jaw unit. It still sounds more intimate and congested than the Alfa Genus. Value (8.5/10) – Rock Jaw scores a value win with their first official US release, the Alfa Genus. I quite liked the compact design, flexible cable, and slim plug of the earphones, but found myself wishing for slightly firmer strain reliefs and a cable cinch. The Alfa Genus is especially noteworthy for using a functional tuning system that actually changes the sound in a very obvious way. Both the silver and gold tunings are well worth the money, and two different sound signatures in a single earphone are always more interesting than one. Hi Joker, I have been reading over 100 reviews and I still can’t seem to grasp the best IEM under 100 for hip-hop and female vocalists. I’ve looked at the ATH-IM50 (was praised immensely over at the head-fi forums). Could you recommend me your best choice for my genres please? I love s good strong deep bass but also an IEM that hits the right vocal spots. Thank you so much! The cool thing about the Alfa Genus is its versatility with those tuning filters. It sounds like you’d be using the bass-heavy filters which may be a little too v-shaped for your vocal needs. However, if you’d consider swapping between filters when necessary it can still be a solid option. Otherwise something with enhanced bass but less of a v-shaped signature might work better – maybe a Shure SE215 or even JVC FXT90 if you don’t mind slightly brighter treble. I’ve only tried the IM50 briefly and I can tell you that it its signature is more like the gold filters of the Alfa Genus than the bass-heavy silver filters. However, I can’t say anything about absolute performance as I’d need a lot more time with it to have an opinion.